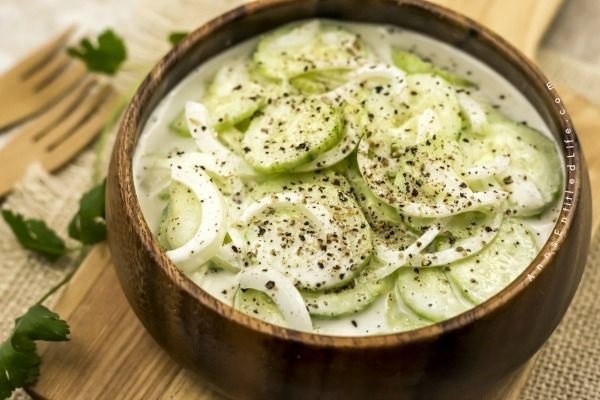 Grandma’s old fashion Creamy Cucumber Salad Recipe. 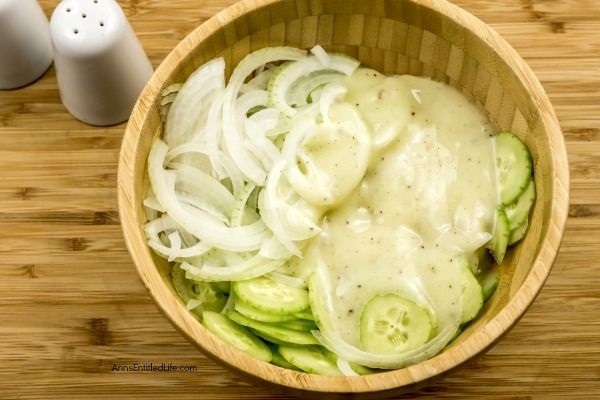 Super easy to make, this is a delicious blend of cucumbers and onions in a sweet, creamy sauce is the perfect cucumber salad recipe! 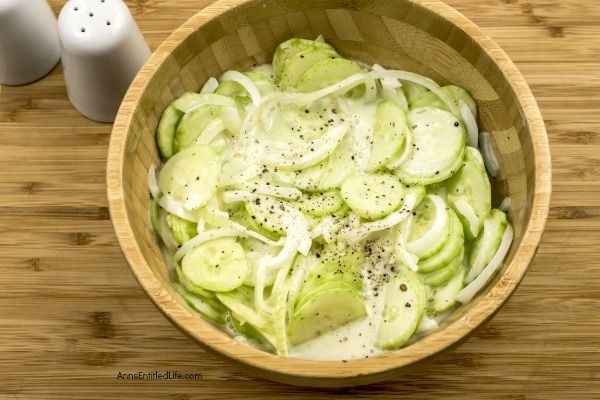 You may have called this old-fashioned creamy cucumber salad a cucumber onion salad, or perhaps simply cucumber salad. I am pretty certain we always called it by the creamy cucumbber salad name growing up. This was served at every picnic, and backyard BBQ when I was I was a youngster. I had wanted to make this for quite some time (years ago), and just had not done so. When Hubby saw it, he was skeptical; it really does not look like much of anything. After one bite, he was hooked! 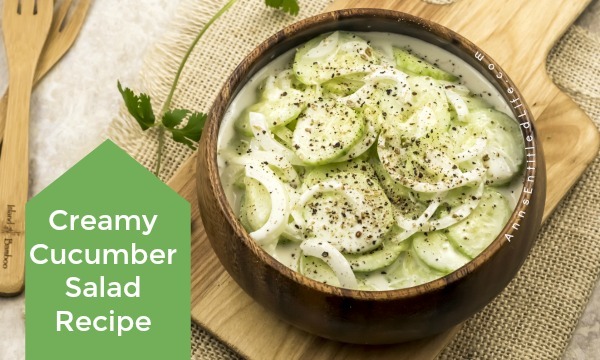 When we finished the first round, he kept asking me to make this creamy cucumber salad recipe again (and again, and again)! It truly is delicious. Not only is this an easy cucumber salad recipe to make, it keeps a long, time when covered in the fridge. When the cucumbers are all eaten, you will have quite a bit of juice leftover. Add more sliced cucumbers (and onions) to that existing juice-mix and marinate again! I keep this in a covered bowl and use make great use of my homegrown cucumbers (I swear I am the cucumber-growing-queen). Early in the season I will start with a store-bought cuke, or an English cucumber (no seeds). • I wrote six servings but it is really eight to 10 servings depending on appetite. 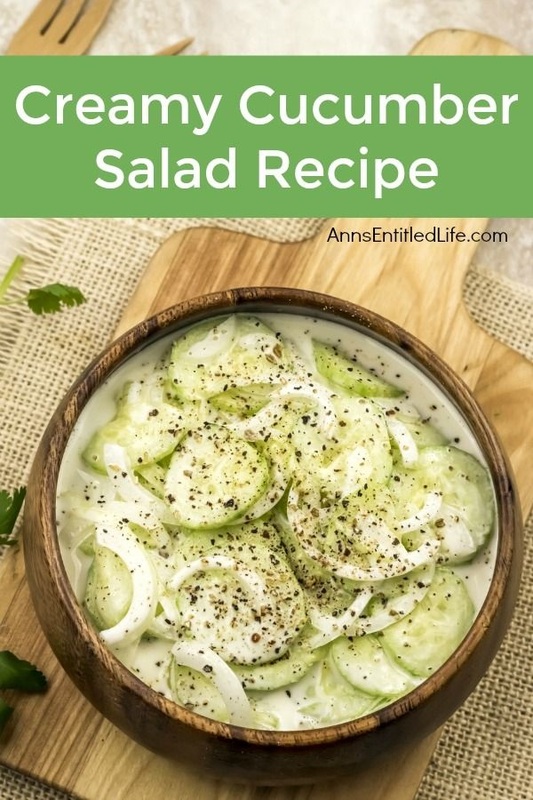 • This creamy cucumber salad recipe is no-bake, but it does requite time to marinate. You can make it the night before, or early the morning of when you plan to serve. • Wash, peel and thinly slice 4 large cucumbers. Use a mandoline for uniformity. • Peel and thinly slice 1 medium sweet onion. 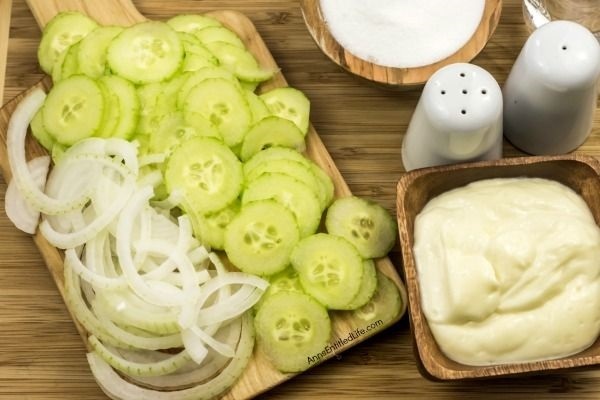 • Place the sliced cucumbers and onions in a ceramic, glass or plastic bowl that has a lid. • In a small bowl combine mayonnaise, sugar and vinegar. Mix until smooth. 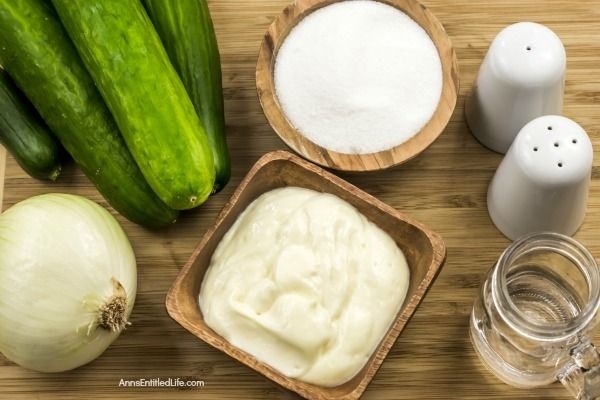 • Turn the mayonnaise mixture into the cucumber and onion mixture, combine well. • Cover with a lid, shake lightly. • Allow to marinate in the refrigerator for a minimum of 6 hours (overnight works well). 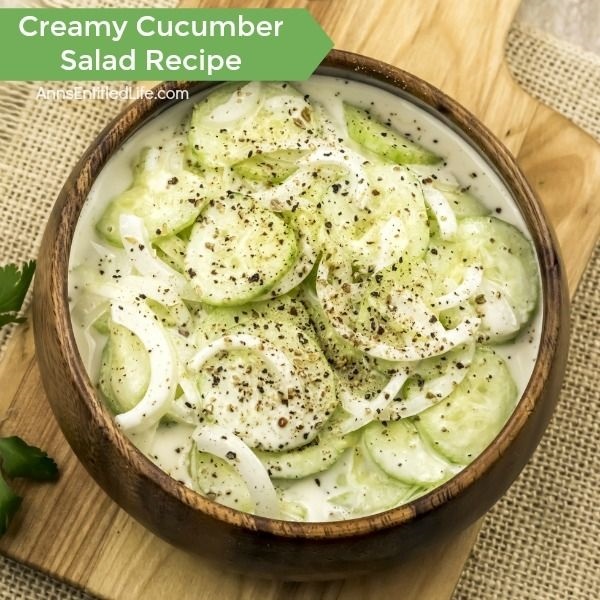 • To print the Creamy Cucumber Salad Recipe click here. • Cucumber Caprese Salad – Hubby came up with this cucumber caprese salad recipe years ago. It is fresh, easy to make, and totally delicious. It is one of the most popular recipes on my blog. • Cantaloupe Prosciutto Mozzarella Salad Recipe – Just 15 minutes from refrigerator to table for this refreshing and tasty Cantaloupe Prosciutto Mozzarella Salad recipe! Excellent as a dish dish or lunch time meal. • Four Color Caprese Salad Recipe – a riff off Hubby’s cucumber caprese salad recipe. 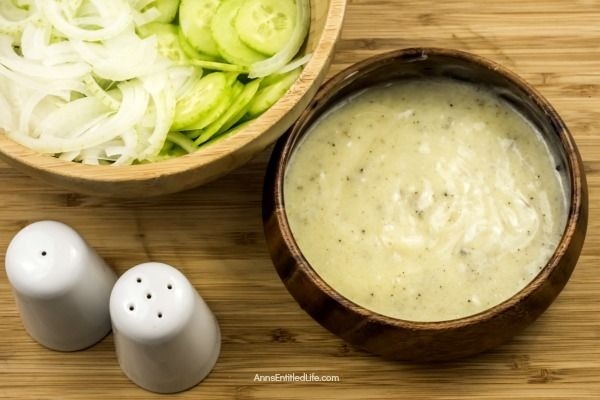 this creamed cucumber recipe goes way back at least a hundred years, have been using it for decades and then it was being used decades before me, it is also very good on top of mashed potatoes and is a very delightful hot summer side dish. Cucumbers are one of the few veggies enjoyed by my entire family. Pinning this one for sure! Thanks! I’ve never eaten cucumbers like this. Sounds like an interesting combo. I’ve been making this for a couple of years now with the addition of dried dill and a squeeze of lemon juice. My neighbour said he would never eat cucumbers any other way again. In the summer time I like to make this salad. Meatloaf and mashed potatoes. Then I serve the Creamy cucumber salad “sauce” over the potatoes. Make this a head of time so the cucumbers render their liquid. since you put sugar in it is it sweetest ? Glenda, it is sweet, and it does have a nip. It really is very good! If you have a lot of cukes, you can make up one batch of juice, eat the cucumbers, then for the next batch, just add more cukes! It says mayonnaise do you use real or can you use miracle whip? Bridgette, I have never made it with miracle whip. Knowing what I do about how mayo and miracle whip are made, I would say that miracle whip probably isn’t a good choice. You can of course give it a go, but I think if you do it is for one time (IOW you can’t add cukes to your mayonnaise based “juice” to keep the recipe going for a week). I make it with Miracle Whip but cut back on the sugar. The Miracle Whip gives it a little more tang. Also, I use white vinegar instead of apple cider vinegar. If you use apple cider vinegar and Miracle Whip, you probably don’t need to use any sugar. If you cut your cukes an hoir ahead of time and salt them in a colander set over a bowl it will draw alot of the water put before you add them to the dressing. Keeps your dresding from getting so watery the next day. Would you then rinse them or do you just lightly salt them? I’ve made this for years. We call it Scandinavin Cucumbers. It is delicious!! 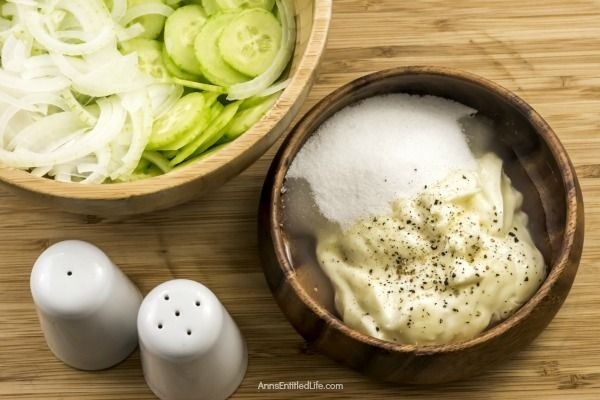 Try it using sour cream instead of the mayo and vinegar. It’s really refreshing in the summer! Thank you for taking the time to link up with us for the Brag About It Link Party! Laurie, I make this cucumber salad all summer long (there is a bowl in the fridge now!) I hope you try it, and enjoy. This looks delicious and the perfect salad recipe for a summer potluck! Thanks for sharing it at Motivation Monday. Your recipe is one of this week’s features. This is so classic. When I used to live in SD they ate this all the time. Thanks for posting. Hello from Motivation Monday. I have made a version of this for years but without the mayo. It’s a Southern staple. Trying your version although I did add salt, pepper, and a dash of chili powder. Yay me…got to try out my mandoline for the first time. I hope you enjoy it, Denise. The chili powder seems like a great twist! It was a huge hit. Also threw in some grape tomatoes from the garden. I am so glad you liked it, Denise! We had it again this weekend for a get together (no chili powder), and people who had not had it in years were tickled to be able to have it again. This looks an awful lot like my recipe. I am 82 and this was a regular salad at our dinner table I knew I forgot part of the receipes I think it was the cider vinegar. Going out to get some cucumbers and try my new nutraslicer. I love all your blogs. Cucumber salad is our favorite summer side. Pinning!